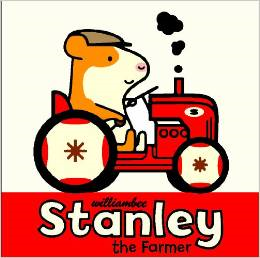 Stanley the hamster has a busy day ahead on the farm. He needs to plow the fields and plant wheat. Luckily his mole friends, Shamus and Little Woo, will help him out. They spread manure (“smelly work”), pour seeds into the hopper and water the fields twice a day until a blanket of golden wheat appears. But their work isn’t done. They must cut it down with a combine and clean up the remaining straw with a baler. Stanley is grateful for his friends’ help, and he rewards himself in the evening with a meal, a bath, and a good night’s sleep. Recommended for the machine obsessed (pre-k through first grade), this cheerful book introduces young children to the concepts of farming and planting and gives exposure to agricultural terms. Readers will love Bee’s digital art, created with chunky shapes, thick lines, and bold primary and secondary colors against a clean, white background. Bee also includes visual cues within the text to assist with comprehension (“pulls the green plow with his red tractor”). The concept of time is a bit confusing, though, as the story alludes that everything took place over the course of a day (“Well! What a busy day!”) instead of months. Visit www.peachtree-online.com to view other titles in the Stanley series.